Invisalign has gotten so popular since it was created in 1997, and it’s easy to understand why. It’s so great for anyone (not just teenagers) who want a straighter smile without the look of metal braces. It’s a lot more convenient, and a lot less uncomfortable. It requires fewer trips into the dentist for adjustments and once insurance is applied, it can cost about the same as traditional braces! If you’re considering this option, you’re probably wondering what a typical Invisalign timeline looks like. How long does the whole process take and what are the different stages you’ll experience along the way? Most patients will require between 12 and 18 months of Invisalign use to see the best results. Everyone’s results vary and your dentist will be able to help you set a timeline for your specific dental needs, but it’s probably safe to plan on at least a year, though it’s very possible you will start seeing results in just a matter of weeks! 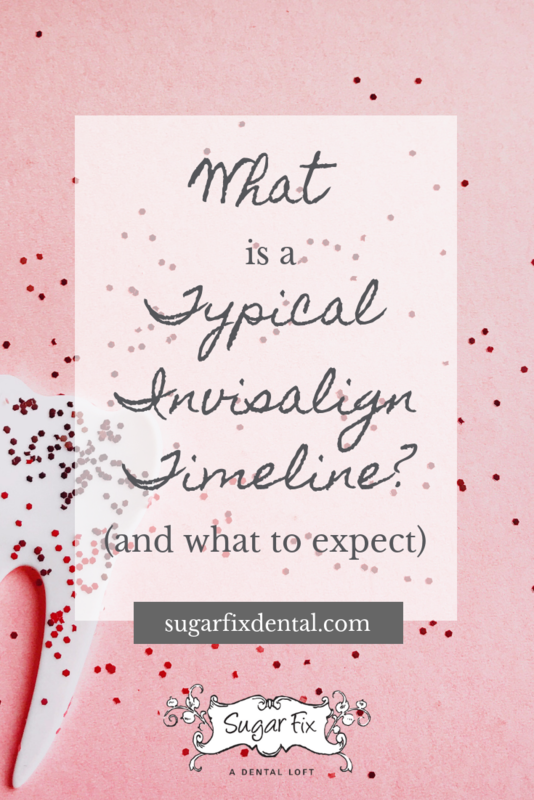 What’s the First Step in the Invisalign Timeline? Your Invisalign journey starts with an initial consultation. During this appointment, we’ll look at your teeth, talk about the concerns you have, and I’ll give you an idea of how quickly you can expect to reach your smile goals, as well as an estimated treatment cost. Once you make the decision to proceed with your Invisalign treatment plan, we will schedule you for a dental checkup and cleaning so we can make sure your teeth and gums are in tip top shape. Then, we’ll get you fitted with your first set of trays! Keep in mind, you’ll need to wear them 20 – 22 hours per day to get the best results possible. Just like with traditional braces, we’ll need to see you every once in a while to make sure everything looks great and you’re seeing the results you want to see. However, with Invisalign, we don’t need to see you quite as often as an orthodontist would for metal braces. We’ll schedule you for a checkup about once every 6 – 8 weeks. Once we’ve determined that you have reached the end of your treatment plan, we may advise that you use a retainer to prevent your teeth from shifting. Everyone’s teeth are different, so this may or may not apply to you. If you do need to wear a retainer after your Invisalign treatment, there are a lot of great options that are custom fitted to your mouth and there are even options that are completely clear just like your Invisalign trays so no one will even be able to tell! Are you interested in Invisalign and ready to get started on the road to a more confident smile? Just give us a call at (773) 883-1818 to schedule your consultation! At Sugar Fix Dental Loft, we offer a full array of cosmetic dentistry services in addition to Invisalign, including same day crowns, porcelain veneers, and sedation dentistry.